Israeli population grows by 2.2% since last year’s Independence Day, approximately 195,000 babies were born; 36,000 made Aliyah. With the establishment of the State of Israel in 1948, the population stood at about 806,000. 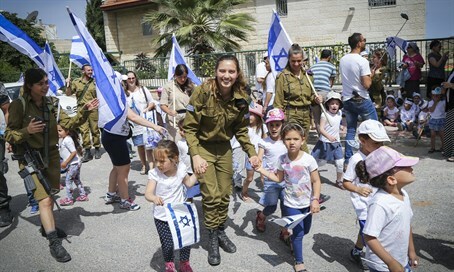 68 years later on Yom Haatzmaut (Independence day) 2016, Israel's population stands at approximately 8.522 million, according to the Central Bureau of Statistics. The Jewish population is approximately 6.377 million (74.8% of the population), the Arab population is approximately 1.771 million (20.8%) and the rest of the population (non-Arab Christians, other faiths and no religious affiliation by registering in the Population Registry) is approximated at 374,000 (4.4%). Since last Independence Day, Israel's population grew by approximately 182,000, an increase of 2.2%. During this period, Israel welcomed approximately 195,000 babies, and about 47,000 people died during that same period. The number of Olim (new immigrants) coming to Israel was 36,000 people. About 75% of the Jewish population are "Sabras” (born in Israel) and more than half are second generation in the country, compared to only 35% in 1948. In 1948 there was only one city in Israel with more than 100,000 residents – Tel Aviv-Jaffa. Today, there are 14 cities with more than 100,000 residents. Of those, 8 cities have more than 200,000 residents: Jerusalem, Tel Aviv, Haifa, Rishon Lezion, Petah Tikva, Ashdod, Netanya and Beersheba.